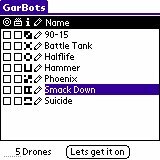 GarBots is a fun and exciting educational software game for programming robots, written for the Palm PDA. Supports both B&W and Color. You don't have to be a professional programmer to enjoy GarBots. Anyone can use the very simple BASIC subset to create logic for your GarBots. It's a fun and educational software game too. Here are just a small sample of the benefits GarBots provides. Educational - Whether it's yourself, your student, or your school classroom, GarBots is a fun and enthusiastic way to learn the academic concepts of any instructional programming language - flow control, data structures, conditionals, loops and more. Learn or practice trigonometry math in a fun instructional way that clearly illustrates the association between mathematics real life uses. Included Example robots illustrate how simple the GarBots programming commands are. New robots can be created with sample program, ready to go and contest against drones or opponents. This lets you get playing and learning the game right away, without ever writing a single line of robot instructions. Built in editor - You can program, test, and debug your robots and your robot programming, all without ever leaving the GarBots program. Bookmarks, undo, it's all there. Built in help system - Every aspect of the program is documented. You can learn about each and every GarBots option and programming language command without ever leaving the GarBots program. Debugger - Built in debugger lets you step through your robots programming commands one line at a time. You can inspect variable, inspect program flow, and easily discover why your robot programming is not behaving as you intended. Built in drone robots - You can specify any number of drone, or target robots to test your robot programming language against. The drones can even be told to 'wander' about the arena aimlessly in order to further intrigue your experience. View your progress - Contests are represented in real time animation of the actual play that is taking place. Scanning for opponents, projectile firing, program print-outs, everything pertaining to the contest is available. Customizable icons for each robot - You know who-is-who during a contest because each robot has a unique icon that can be designed by the user. Contests can include or un-include any and all robots programmed - tournament play in other words. Students or an educational instructor can collect robots and hold a tournament for extra credit. A simple checkbox in the main GarBots interface is all it takes to start setting up a tournament (or simple contest for that matter too). Beaming and exporting - Speaking of tournaments, robots can be beamed to other devices, or exported for Sync to allow sharing of robots. Students can create and beam their robots with each other or with an instructor. Important!!! Robots can be beamed with privacy enabled so that opponents cannot read your valuable robot programming source code. Configurable contest parameters - The options and possibilities are boundless when all parameters are configurable - Scanning, projectile size, power-up, and many more - all are configurable to keep things interesting - "What would happen if we tweek this way?" till the cows come home. Your parental prowess will be obvious and impress your students teacher when he or she is ahead of the computer class peers. Recylce your old Palm handheld / pocket personal digital assistant (pda) by handing it down to your student pre loaded with Garbots. 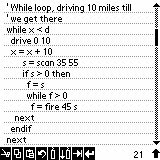 Works with all Palm OS PDA including Sony Clie. This is the main screen for GarBots. Here, you create new GarBots (with or without example skeleton code). Set up the number of drone robots, select battle participants, edit source code, and your robots icons. From the menu, you can export or even Beam a GarBot (beaming a GarBot renders its code non-viewable on the recipients device so your coding secrets wont be revealed) for competition with your friends GarBots. This is the edit screen where you write your robot programming. Handy tool bar makes common. Standard functionality a snap. Small font is included so you can see more of your code at a glance. Here we see a battle going on between two GarBots robots and several drone robots. Drones do nothing but just sit there and wait for your robots to find and defeat them. The triangles show up when a GarBot scans an area for opponents. You can see there have already been a bunch of shots fired from the red and yellow explosions on the battle field. At the bottom of this image, you can see the output of a GarBots PRINT function used for debugging. You will also see messages from the GarBots interpreter complaining about incorrect program syntax. GarBots v1.6 released. Three new features included. Wandering drones, can wander aimlessly around the arena. The big news with this latest release is the built in debugger. You can set a breakpoint on a line of code in your GarBot code, and when that line executes, the debugger screen will popup, giving you the opportunity to view the values of constants and variables, step through source code lines, and even update the values of variables. Also, the interpreter has undergone some visible optimizations. It should run noticeably faster for you. New editor is vastly improved, including small font, book marks, and tab insert. Additional math functions - ArcSine ArcCosine and AarcTangent have been implemented, in addition to new conditional operators. Power up option allows GarBots to increase their power as they decimate their opponents. Also - Please discontinue usage of the GarBots Export utility. It is no longer supported, and will mangle your GarBots preferences. Instead, please find the same functionality an integral part of the program, available through the menu system. Game play has become much richer with this release. Battle constants are now configurable including scanning radius, damage radius, Life power and others. This leads to almost limitless variation in battle dynamics. You can now export your GarBots for sharing with others, or posting on web pages. I can post them here for you, you, or you can post them to the Yahoo GarBots group. Please see the GarBot Extractor (left) for details. 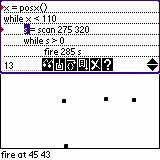 Palm OS 3.5 and higher. Updates - Bug fixes and minor improvements will be downloadable at no extra cost when available. Buy now for the special offer price of $16.95. This price can change at any time. Device synchronization name: what is this? "this is the best program out! I'm 12 and program games, but this one is the best i've seen and used! Pleaase continue to make programs like these! Maybe a Garbots 2? Great game, but would like to see HI RES options incorporated, mostly in the fonts for the editor, but also updated arena graphics as well. Really a nice piace of software. I like the debugging function, which allows to make complex coding. It would be nice, if the bots have a shield function to survive heavy fire from 'simple but fast bots. This is terrific! Good brain working programs are few and far between. My son and I are busy swapping bots via IR. Like Core Wars but easier to learn. Good fun game. The developer is very responsive to bug reports, and the new interface is great. Great program with lots of potential. Author keeps improving and responding to suggestions. Great game with simple yet effective programming language. the bugs named in other reviews here are fixed and when you are using the shareware version of the game you can try your bot agains drones in the area. Don't let a drone victory fool you because playing against other peoples bots is something totally different, i would highly recomend this game and would also like to suggest not using the standard bot as a start but begin building one from scratch with the purpose of beating the default bot. It's really fun to program your bots in this game, and it gives you a lot of power over doing so, but the graphics need a little work... 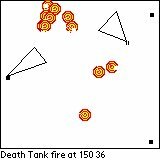 Explosions stay on the screen, and when a bot moves over an explosion, it half erases it. Also, you can't tell which way a bot is facing. It would be better if it looked a little nicer. Other than that though, it is great! It's fun to compete against your friends' bots. I rated this game 'good' based on concept and execution; it reminds me of the 'Omega' and 'Carnage Heart' and I'd been meaning to write it myself. The programming language looks good; graphics could be better but that can be added later. Only problem is, you can't try it out without buying it (demo only lets you have 1 tank which therefore instantly wins, game over). Copyright(c)2005, by Scott Hares, All Rights Reserved.